For all of our elementary students, our day begins at 7:45 a.m. with Convocation in the cafeteria. During this time our principal Mrs. Hatch leads students in prayer, song and provides daily updates. Parents are welcome to stay through convocation. Students are in their classroom ready to learn by 8:00 a.m.
Grade 1: During this important year teachers work to build a firm educational base that will assist students through elementary school and beyond. Much of the curriculum centers around reading writing, spelling, narrative and expository writing. Curriculum highlights include: Addition & Subtraction, Comparing, learning about money, time and problem-solving. Science studies include learning about animal families, plant and water cycles, and the earth’s surface. Grade 2: During this year of growth, teachers dive further into literary elements, such as theme, character, plot, and setting. During this year it is anticipated to see growth in comprehensive skills, increased vocabulary and improved fluency skills. Curriculum highlights include: fractions, graphs, estimating, place value to 1,000, plants and animals, sun and space, weather, states of matter, maps, government, and community. Grade 3: During this exciting year, students learn about the History of Michigan through Statehood, physical science, force, and motion. The classes read Charlette’s Web, biographies, mysteries and historical fiction. Students focus their time on learning cursive, understanding the writing process and various writing genres, and applying listening and speaking strategies. Grade 4: During this year our young leaders emerge, learning about Geometry, adding and subtracting fractions, and decimals. Learning begins to expand outside of Michigan and focuses on learning the geography of the United States, government .and civics. Students read novels, including Because of Winn Dixie, Christmas Carol, Holes, Indian in the Cupboard, and the Lion the Witch and the Wardrobe. Grade 5: During 5th grade, students begin to learn presentation skills and plan presentations for end of unit projects. This year is full of learning! The brochure is eleven pages long, and includes an extensive breakdown of learning activities by subject and quarter. A great read for parents of future 5th graders. Once students complete 5th grade they are considered Middle School Students. We believe it is important to expand our experiences beyond the classroom. Our elementary students can anticipate participating in the following field trips, among others, during their time in grades 1st through 5th. It is important for parents to know that we do offer an afterschool option for elementary students. Our After School Academy (ASA) is available from 2:50 p.m. to 6:00 p.m. Monday through Friday. The cost for ASA is $15.00 per day, per student, or $5.00 per hour, per student. There are additional fees added after 5:30 p.m. Snacks are not provided to students during this time, but they are welcomed and encouraged to bring a snack. For more information on ASA please contact the school office or your student’s teacher. We know and understand that being a parent of an Elementary School student can leave you with lots of questions. That is ok, we are here to help! Parent Ambassadors: Every class has at least one parent ambassador. This can be a great resource for parents to learn more about our school, participate in classroom activities, or get to know some of your fellow elementary parents! School can be as much about what the parents put into learning as the students. Some of the significant events/programs sponsored by the ambassadors are: Field Day, Campbell Soup Label Collection, Spartan U.P.C. Labels, General Mills Box Tops for Education, Gordon Food Service Fun FUNDs, SCRIP Program, and welcoming new families. 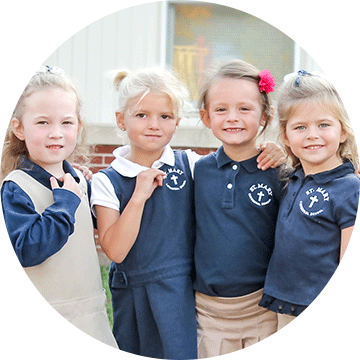 Note: All of our students participate in our school-wide uniform standards. For details on our uniform requirements please click here.